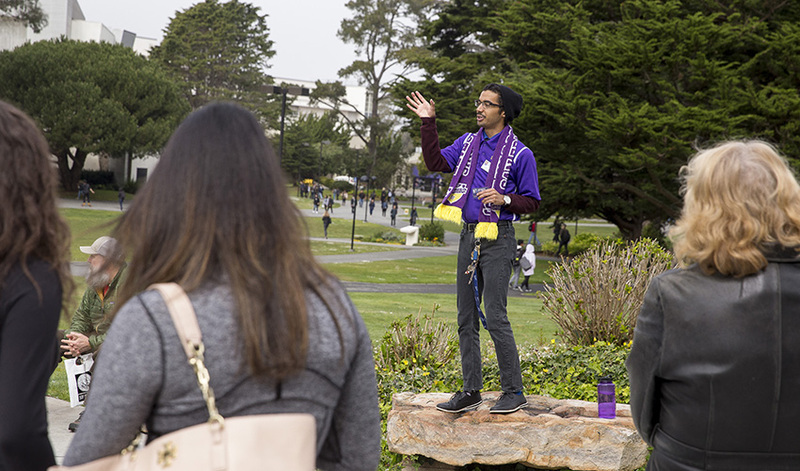 SF State student ambassador Victor Javier Aguilar leads parents and prospective students on a tour of campus. San Francisco State University senior Mando Perez remembers setting foot on campus for Sneak Preview Day in spring 2013. He was planning to enroll that fall, and it was his first chance to see the University in action. He brought his parents — Mexican immigrants whose educations ended in elementary school — and two older brothers. This was their first time on a college campus; they were blown away by all the amenities, he says. But what stood out for him was coming face-to-face with the Gator. “Seeing the mascot gives you a sense of pride and gets you pumped. I took a picture with the Gator and I still have that photo on my social media feed,” Perez said. Today, as a student ambassador, he’s the one donning the Gator costume and leading campus tours. Nearly 16,000 potential students and family members are expected to attend SF State’s 2018 Sneak Preview on April 7, according to SF State Director of Student Outreach Services Ree’shemah Thornton. The annual event is open to first-time freshmen, admitted transfer students, high school students looking ahead toward college, and families and friends. The all-day open house is a chance to experience the campus’s unique offerings, from strong academic programs and vibrant student life to residential and dining options. Representatives from many academic departments and student organizations will showcase their curricula and offerings. Prospective students and families can attend workshops on financial aid, take campus tours and learn about SF State’s more than 100 majors. They can officially accept their admission offers and register for summer orientation in the University’s J. Paul Leonard Library. The day is as much about engaging parents as it is about the students, Perez said. His parents had concerns about the cost of college. Sneak Preview Day provided them with the clarification they needed about scholarships and financial aid, he says. His mom had other worries about safety, housing and food. “My mom always asks me, ‘Did you eat?’ Learning that food was accessible in the dorms was important. Plus, seeing the the dorms and knowing I’d be safe was huge,” he said. For a taste of student life, families and prospective students can head to the West Campus Green to check out student organizations and other activities. Tours of the Mashouf Wellness Center, which opened only last fall, will allow guests to check out its many services and features. Tours will be available throughout the day. “The wellness center is a major highlight,” Perez said. “If you live in the dorms, it’s great to be able to cross the street and work out or play indoor soccer, volleyball and basketball. It keeps students on campus and creates more of a community.” Sneak Preview begins at 8 a.m. and will take place rain or shine. The event is free; online RSVP is recommended. For directions to campus, hotel options and additional details, visit future.sfsu.edu/sneak-preview-open-house.